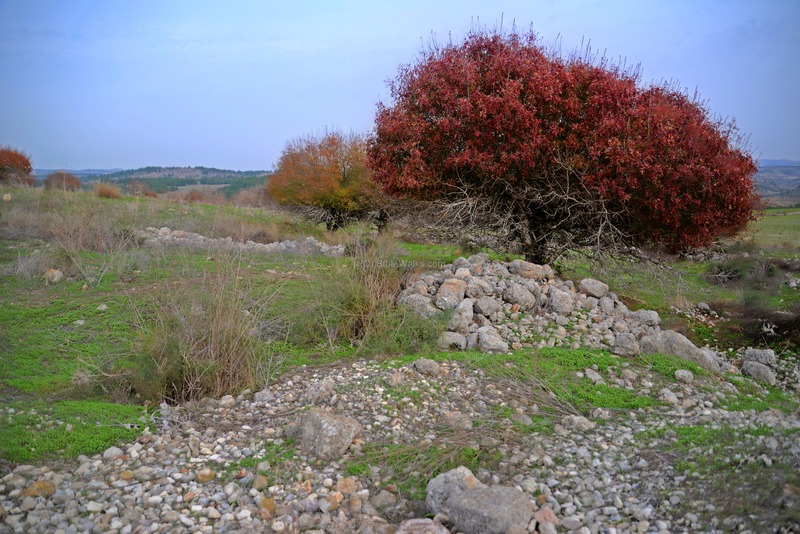 Remains of a Biblical city, located south of the valley of Elah. This was the home village of the wives of Judah, the hiding place of future king David, and a city fortified by King Rehobam. 1 Samuel 22:1: "David therefore departed thence, and escaped to the cave Adullam". 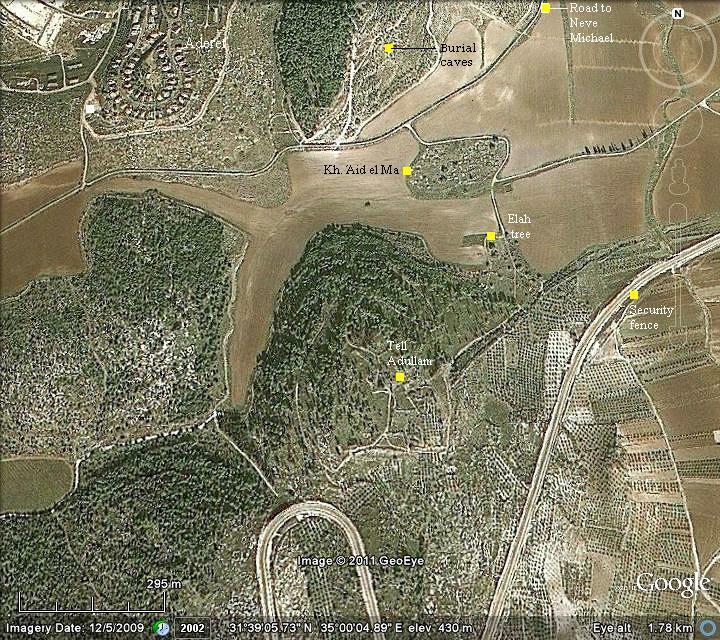 The following aerial view shows the points of interest, with the hill of Tell Adullam in the center. 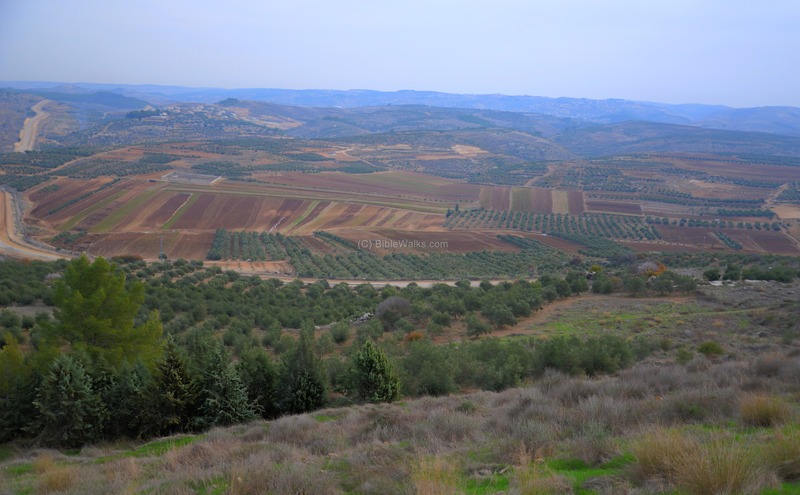 The south side of the valley of Elah is located on the top-right side. The security fence, between Israel and the West Bank, is seen on the bottom right side. 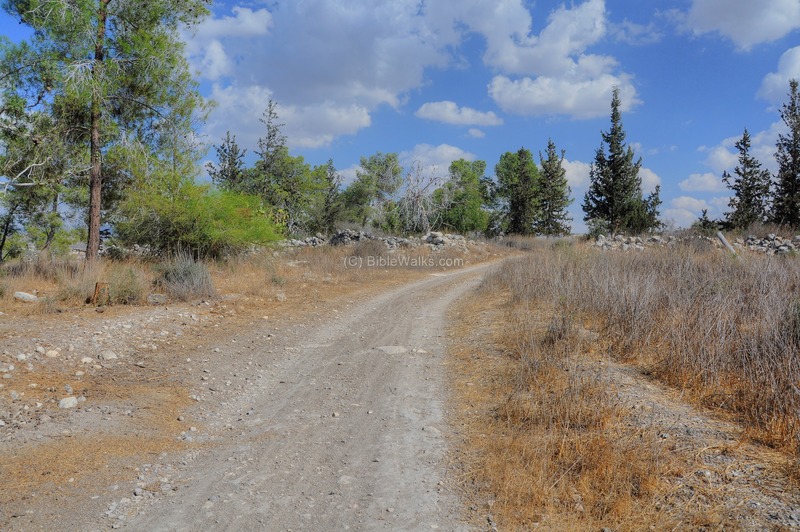 To arrive to the site you can either go south from Moshav-Aderet (the gate is open during the day), or by a semi-paved road from Neve Michael / Rogalit. 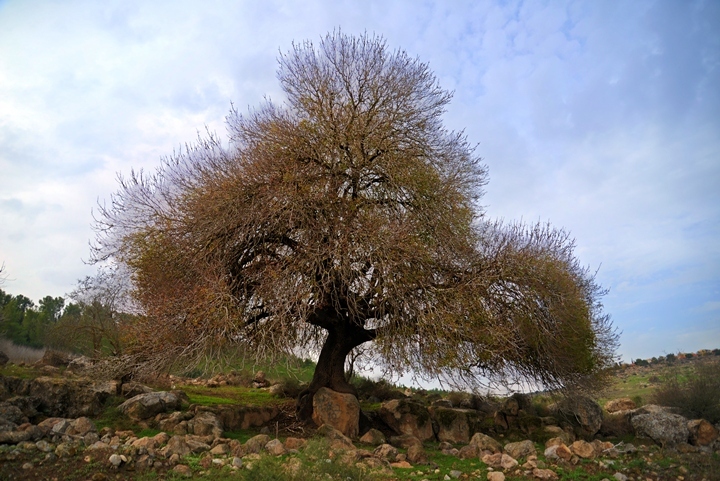 Tell Adullam was first inhabited from the middle of the 2nd Millennium BC. 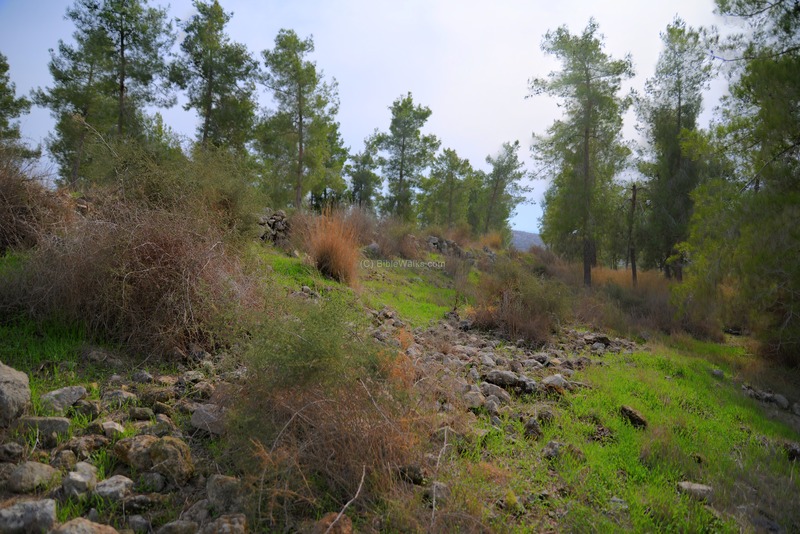 It was one of the Canaanite cities captured by Joshua during his campaign of the cities of the Shephelah . Judah's wives - Judah was the forth son of the patriarch Jacob (Israel). Adullam first appears as the home village of Judah's first and second wives, both Canaanites from Adullam. Judah married his first wife, the daughter of Shuah from Adullam, after he and his brothers sold Joseph to the Midianites merchantmen (Genesis 38:1): "And it came to pass at that time, that Judah went down from his brethren, and turned in to a certain Adullamite, whose name was Hirah". Judah's wife gave birth to two sons, Er and Onan, who later died. His wife also died (Genesis 38:12): "And in process of time the daughter of Shuah Judah's wife died; and Judah was comforted, and went up unto his sheepshearers to Timnath, he and his friend Hirah the Adullamite". Judah then married his son's widow Tamar in Adullam (Genesis 38:20). Conquest of Joshua - Adullam is listed as one of the cities conquered by the Israelites (Joshua 12:7, 15): "And these are the kings of the country which Joshua and the children of Israel smote on this side Jordan on the west... The king of Libnah, one; the king of Adullam, one;". according to this verse is near Socoh (actually, the distance is 4KM to the north-west of Adullam). A Biblical map shows the location of Adullam (in the center, marked by a red circle) and the major roads and cities around it, starting from the Canaanite period up to the Roman period. 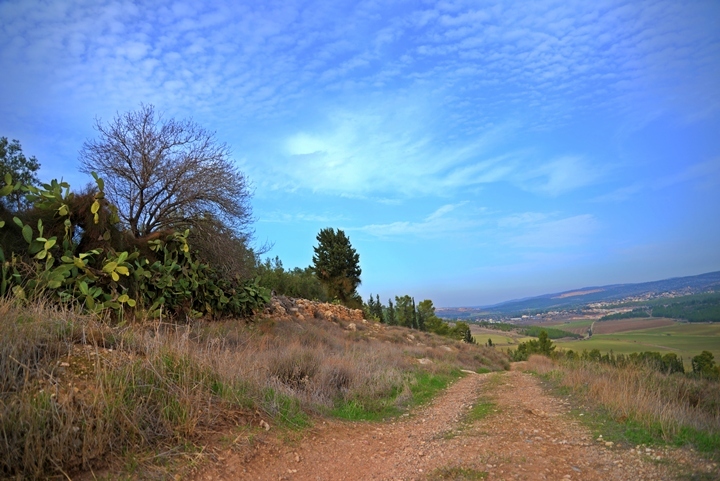 The city is located on the side of a route that ascends from the Valley of Elah to Hebron and Bethlehem. After the battle of David and Goliath and David's victories over the Philistines, he becomes the great hero of Israel. However, this caused his relationship with King Saul to deteriorate. 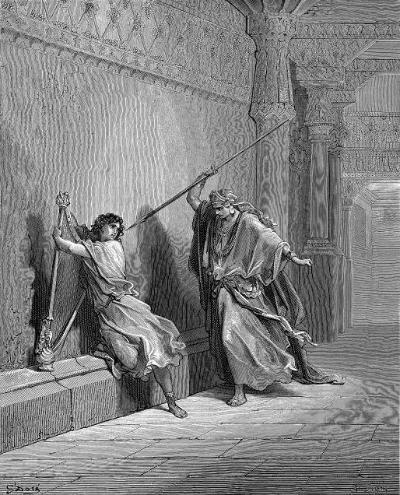 The jealous Saul tried to kill David, as illustrated here. David fled to the Judean desert, and eventually came to Adullam where he hid inside the cave together with his 400 followers. 1 Samuel 22:1: "David therefore departed thence, and escaped to the cave Adullam: and when his brethren and all his father's house heard it, they went down thither to him. And every one that was in distress, and every one that was in debt, and every one that was discontented, gathered themselves unto him; and he became a captain over them: and there were with him about four hundred men.". "And three of the thirty chief went down, and came to David in the harvest time unto the cave of Adullam: and the troop of the Philistines pitched in the valley of Rephaim". This is repeated (in 1 Chronicles 11:15): "Now three of the thirty captains went down to the rock to David, into the cave of Adullam; and the host of the Philistines encamped in the valley of Rephaim". The Assyrian empire, a rising force in the region, conquered the North Kingdom of Israel in 732BC, destroying most of the cities and villages in the land. The South Kingdom of Judah managed to survive this onslaught by teaming up with the Assyrians, but not for long. After the death of the Assyrian King Sargon II (722 – 705 BC), King Hezekiah mutinied against the Assyrians, joining other cities in the area who attempted to free themselves from the Assyrian conquest. Anticipating the coming Assyrian intrusion, he fortified Jerusalem and the major cities, including Adullam. The Assyrian army came in 701, led by Sennacherib, son of Sargon II (2 Chronicles 32 1): "After these things, and the establishment thereof, Sennacherib king of Assyria came, and entered into Judah, and encamped against the fenced cities, and thought to win them for himself". Adullam is also mentioned by the prophet Micah the Morasthite, who describes this destruction of Sennacherib (Micah 1:15): "Yet will I bring an heir unto thee, O inhabitant of Mareshah: he shall come unto Adullam the glory of Israel.". After the return of the exiles to Zion, Adullam was one of the cities resettled by the children of Judah (Nehemiah 11: 25, 30): "And for the villages, with their fields, some of the children of Judah dwelt... Zanoah, Adullam, and in their villages, at Lachish, and the fields thereof, at Azekah, and in the villages thereof.". Adullam is mentioned in the early battles of the Maccabees. The Maccabees headed the anti-Hellenization rebellion against the Greek Seleucids who controlled the land of Israel during the second half of Hellenistic period. After a series of successful military campaigns they took control of Judea, liberated the land and created an independent Jewish country, known as the Hasmonean Kingdom (164 BC to 63 BC as independent state, and 63-37 BC as rulers under Rome). During the early phase of the rebellion, Judah Maccabee commanded the troops, leading the Jewish army to a series of important victories. One of the battles was against Gorgias, the governor of Idumea, a region south of Adullam. After winning this battle near Maresha (June/July, 163 BC), Judah retired his forces to Adullam (2 Maccabees 12): "After the battle Judas led his men to the town of Adullam. It was the day before the Sabbath, so they purified themselves according to Jewish custom and then observed the holy day". 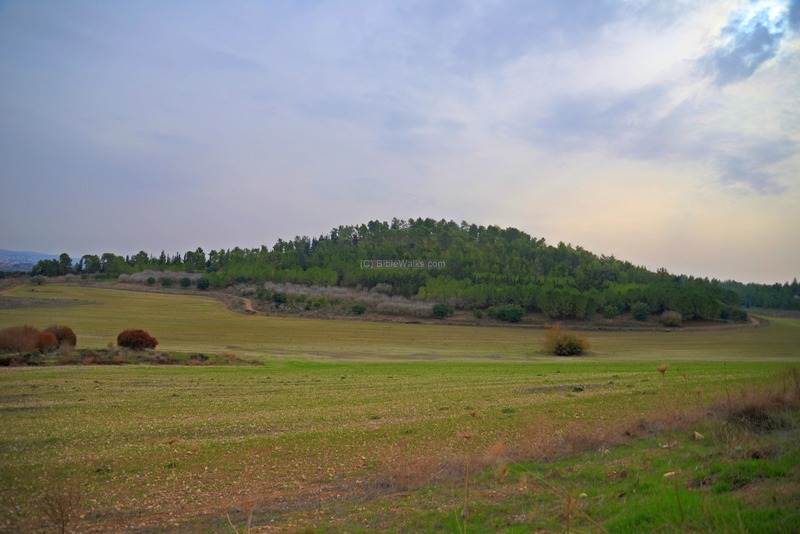 The site was abandoned during the Hellenistic or Roman period, as part of the urbanization trend of migration from the high mounds to the new larger villages. 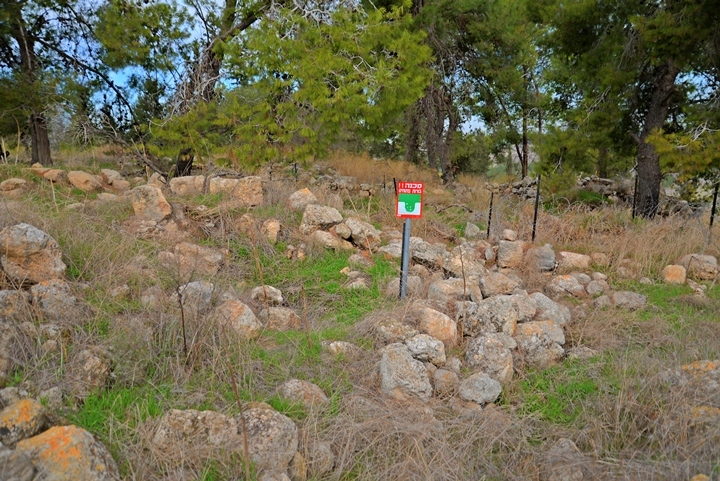 The ruins to the north (khirbet Άid el Ma) and to the west of the hill were probably villages that were constructed during this transition. 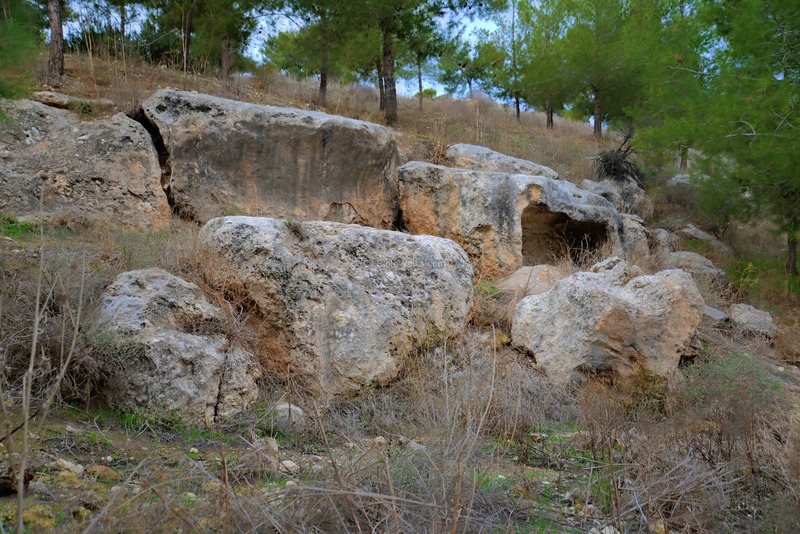 During the Bar Kokhba revolt, the Jews used underground hiding complexes to save their souls. An emergency excavation, headed by Boaz Ziso, examined a hiding complex on the southern side of Tel Adullam. The plan of the cave and the findings were published in 1999 (Nikrot Zurim #20). 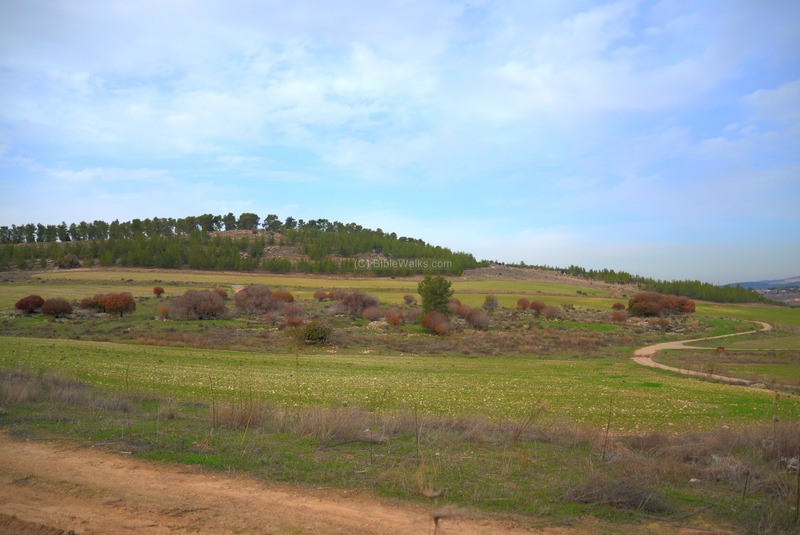 Boaz concluded that the complex was prepared by a family that resided on the Tel during the time of the revolt. "Adolam (Adollam): the tribe of Juda. A large (not small) village (called by that name) is now ten miles east of Eleutheropolis". The distance from Beit Jibrin/Eleutheropolis to Adullam is 15km north east, which matches Eusebius's location. This identification increases the probability of the identification, as it was made at a period closer to the times of Adullam. The area around the site was examined in the Palestine Exploration Foundation (PEF) survey (1866-1877) by Wilson, Conder and Kitchener. Tell Adullam appears on this map of 1878 in its Arabic form - "Khirbet esh Sheikh Madhkur". In 1871 Conder visited the hill above these ruins and provided a fascinating account (pp. 326-367) and explanation of the identification of Adullam in the PEF 1875 quarterly summary. "A steep and almost isolated hill, with terraced sides, is surrounded on the north and west by a narrow valley, which runs into the broad open corn valley on the east. The place rises 300 to 400 feet above the valley, and is a position of great natural strength, being only joined to the general range of hills on the south by a narrow neck. On the summit stands the little Mukam, and round it are heaps of stones and ruins extending over some distance. On the north side of the hill near the top is a cave of moderate size. The rock is quarried on the west, and on this side is a rock-cut tomb now blocked up with a cross cut in front. In the branch valley on the north are two wells, one apparently of great antiquity, with some 30 stone troughs round it and full of water. To the east of this is a magnificent Terabinth (Butmet wady es Sur). On the west, opposite the ruin, is a row of caves on the sides of the narrow valley. These are used by the peasantry in spring for stables. The cave on the hill itself was also inhabited when visited". A ruined village is located in the valley north of the hill, named Kh. Άid el Ma (see map above) - which may have preserved the ancient name. 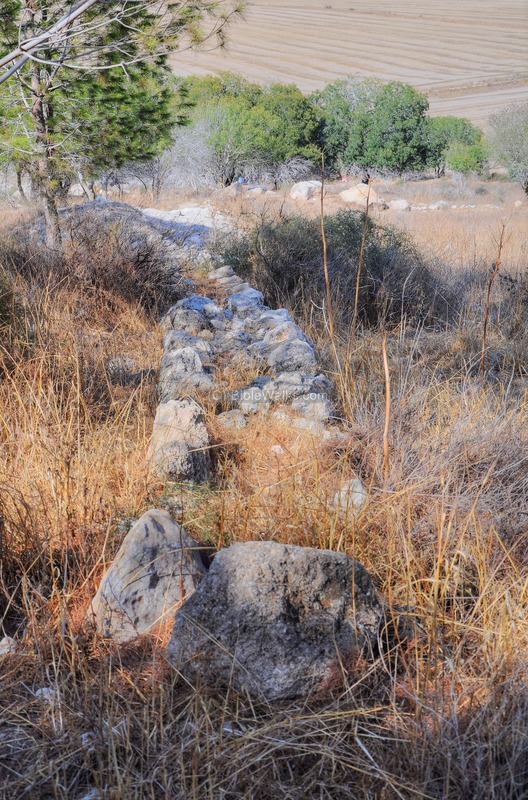 Conder noted (p. 362): "I was struck by the resemblance of the Hebrew word Adullam with that of a ruin called Ed el Miye, situated on the road from Jerusalem to Beit Jibrin, not far from Shuweikeh or Socho...". Conder's report on Kh. Aid el Ma (p. 347): "The name is at present applied to some foundations and heaps of stones in the valley near the two great wells. North of them there are ruined caves on the hillside, and two or three cisterns. The name preserves that of Adullam, but the ancient site is described under the head Khŭrbet esh Sheikh Madhkur." This report is part of the fascinating accord of the exhibition's survey in Adullam. Tell Adullam is part of the Adullam caves park, a KKL forest area. You can approach the site from a north-east road, and climb up the steep hill. 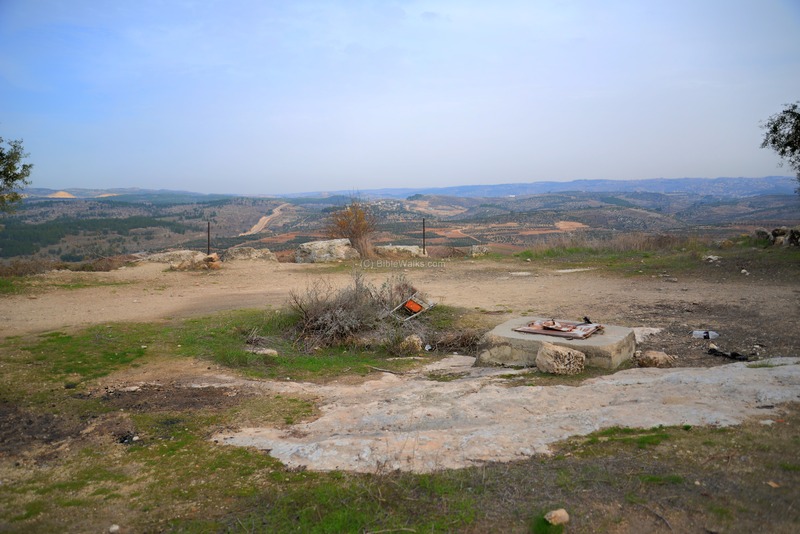 On the summit are few remains, but you are rewarded by the great views of the hills of Bethlehem and the sensations of being amidst the remains of this historic site. The site was not yet excavated by an ordinary archaeological excavation. 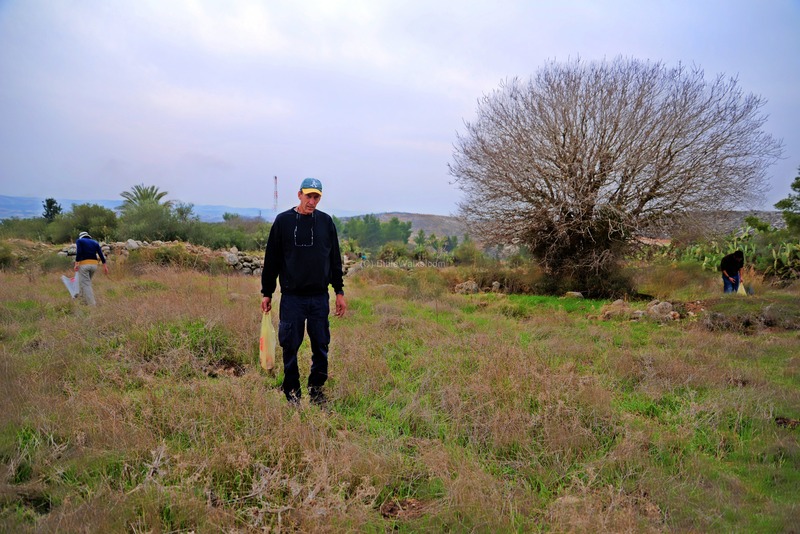 A survey was conducted by Yehuda Dagan as part of the survey of the Judean Shephelah region. 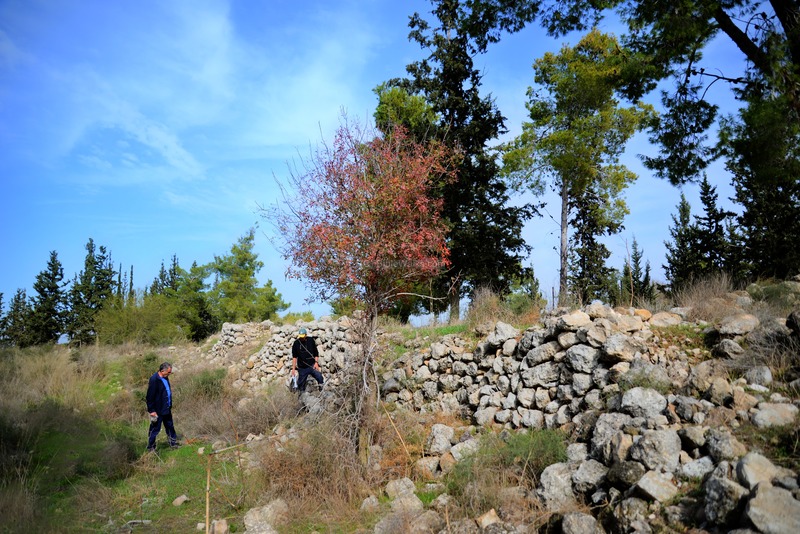 A new archaeological survey, managed by the "Institute of Archaeology - Hebrew University Jerusalem", and supported by the "Friends of the Institute of Archaeology", started in 2015. After reaching to the valley on the north side of the hill of Adullam, the hill does not look impressive, nor does it look like an ancient site. Only after climbing up the steep hill and reaching its summit you understand why this location was used for a fortified city. 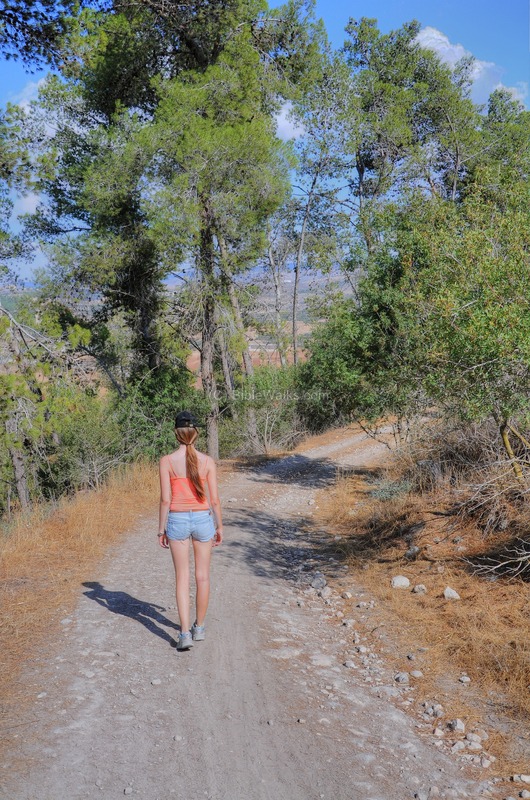 We walked up the road that climbs from the bottom of the valley to the summit. 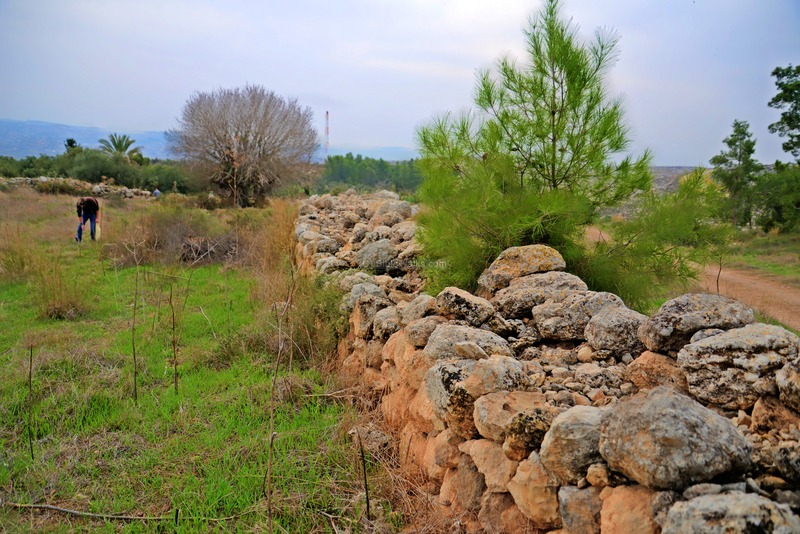 Along the road are traces of walls. 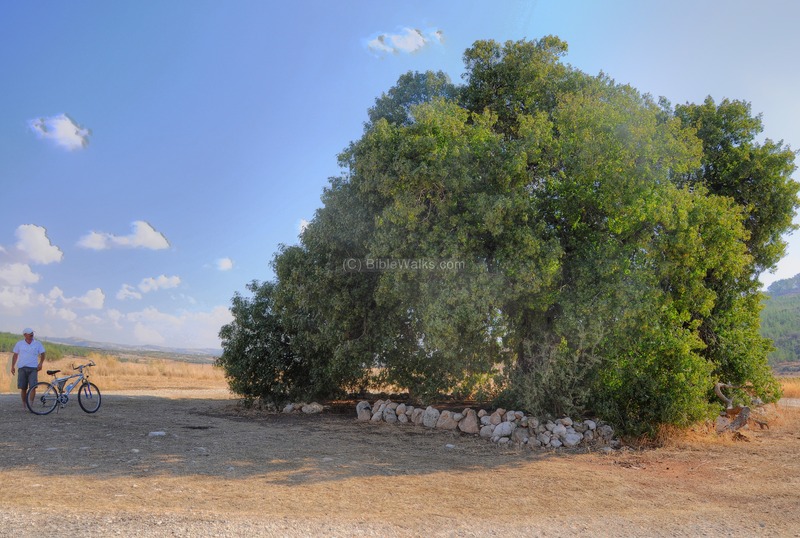 On the north-east side of the hill is a large Terebinth (Elah) tree, which seems to grow out of a rock. While approaching to see how its roots fused into the rock, a snake scared us away... It hides somewhere in the following photo. The road starts with a decent slope, but later turns around the steep face of the hill. 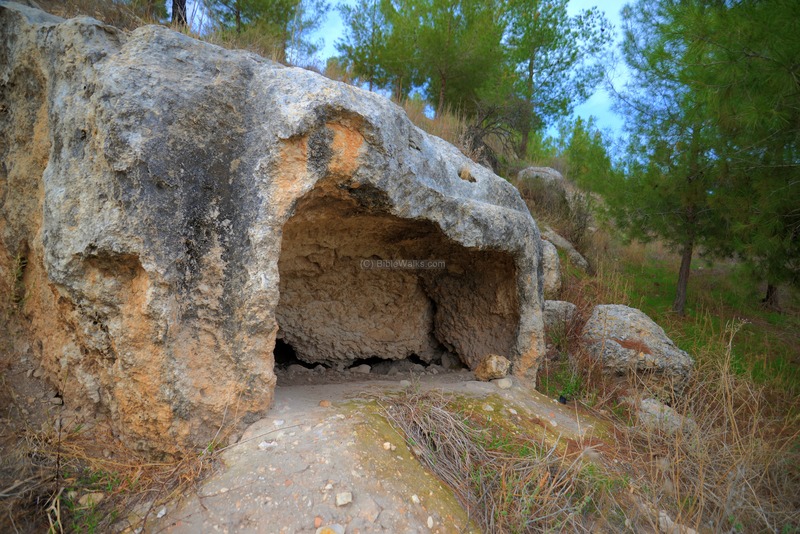 Along the road are several caves, but none of them looked like large enough for the hiding David and his 400 followers. Perhaps they hid in several of the caves in the area. On the east side of the summit are ruins of several houses of an Arab village, and a Sheikh's tomb. Except for several remains of arches, most of the walls were knocked down to form a rubble. An arch of a ruined house can be seen on the eastern edge. This is not the Sheikh's tomb or shrine (Makam), as it is located several meters to the south but has totally collapsed. Except for the ruins on its north east side, and some walls that crisscross the hill, the summit is mostly barren. This can be seen in the aerial view, looking from the east side towards the west side. The security fence, which borders between Israel and the West Bank, passes at the southern and eastern foothills of Adullam. A section of the fence is seen here on the left side, where the paved road loops around the southern side. The west side of the hill is covered with pine trees, but traces of ancient walls can be seen among the trees. This section was one of the areas that our team covered in the archaeological survey of December 2016, where hundreds of ceramic vessel fragments were collected. In the center of the hill are less trees. 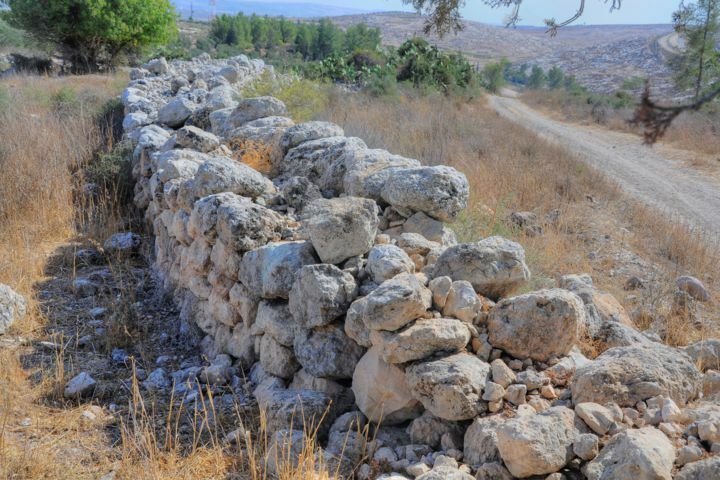 Here too, walls of the ruined Arab village divide large sections of the summit. 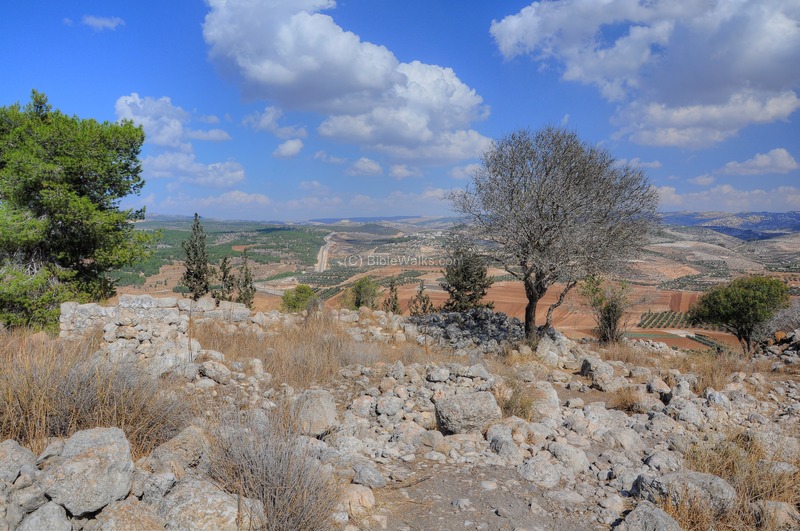 On the east side of the summit are great views of the hills of Hebron and Bethlehem, located on the hills in the background. Near the eastern foothills passes a section of the security fence. A Panoramic view, as seen from the east side of Tel Adullam, is shown in the following picture. If you press on it, a panoramic viewer will pop up. Using this flash-based panoramic viewer, you can move around and zoom in and out, and view the site in the amazing full screen mode (like you are really there). Hotspots are indicated on the view, indicating the major points of interest. The following picture shows a section of the road, and a wall that stretches along it, in the direction to the south. The same section of the wall is seen in the next photo, taken in late December 2016 during the archaeological survey. The following aerial view shows the site from its south east corner. The road loops around the corner and heads down back to the valley. 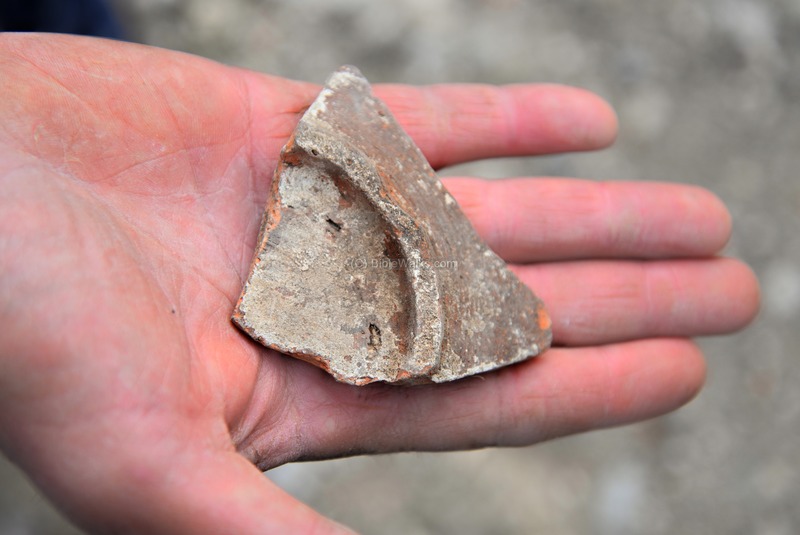 On the ground of the olive orchid are many fragments of first temple period ceramics, which were surfaced due to the deep plowing of the orchid. A ground view of this section is shown in the following photo, looking towards the north. This side of the hill is steep: 100m height difference over the valley which is 600m away. 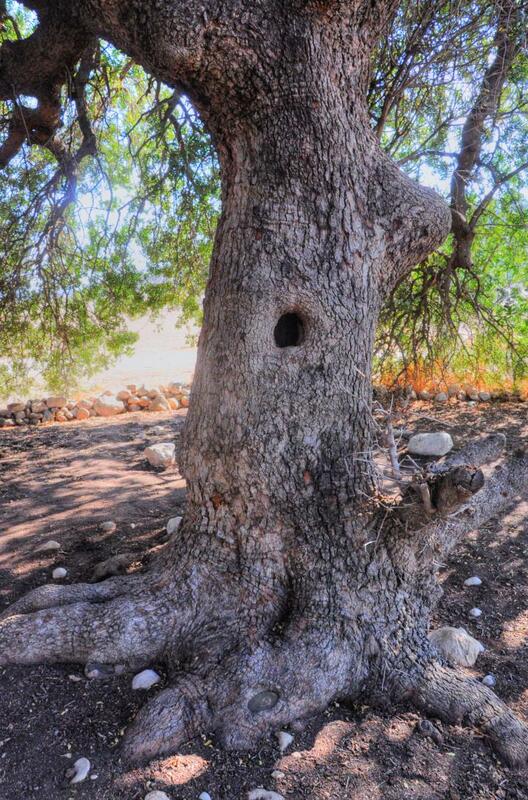 This provided a natural defense during ancient times, and an excellent observation place. Near this corner is the ancient water cistern of Adullam. Its stores runoff rain water during the short winter rain days, then provides drinking water throughout the year. A new archaeological survey, managed by the "Institute of Archaeology - the Hebrew University of Jerusalem", started in 2015. Its first step is to map the ceramic distribution around the site. 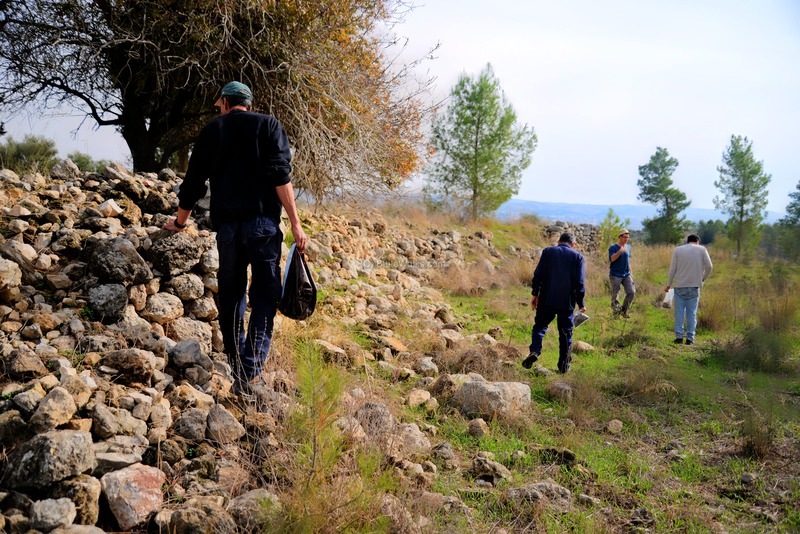 BibleWalks staff participated, together with others, on the first day of the survey of December 2016, which was managed by Elad Liraz (*) and directed by Prof. Yosef Garfinkel and Dr. Uzi Leibner of the Hebrew University. (*) We thank Elad for the great information on the site. The survey process, after its design and preliminary studies of the site, was first to map the site to polygons. 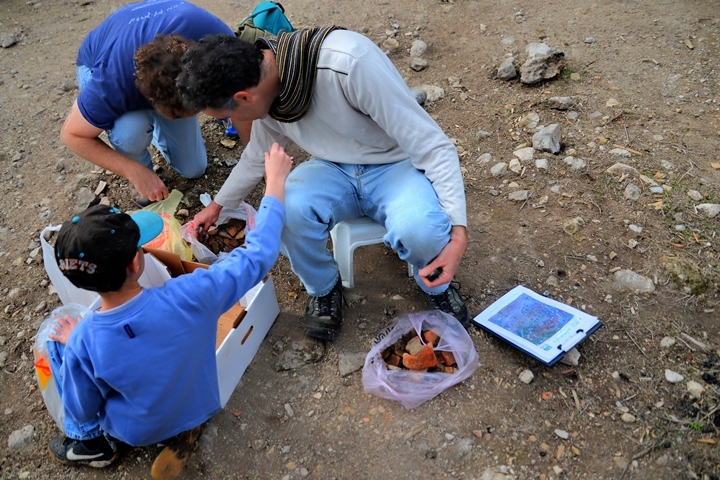 Then, for each polygon, all visible antiquities found on the surface were collected. The example on the left shows the areas where we first reviewed. The team of about 6 people walked up and down each segment of ~5m wide strips and collected in their bag everything that seemed historic - fragments of ceramics, mosaic stones, ancient glass, etc. The findings were then reported on a summary paper. An example of the the top right polygon area is seen in the following photo. Another example of the lower polygon area, where Uncle Amnon holds one of the plastic bag with the collected items along his strip. In each area, such as this one , several hundred pieces were found and brought in for analysis. The archaeologists normally date the ceramics by unique sections of a vessel, such as the form of the rim, combined with the material and quality of the piece. Therefore, the step #2 was to sort out the dateable pieces, which reduced the number of pieces by a factor of 20 or more. The next step #3 was to let the experts to review their findings, and provide a preliminary composition of the findings by their periods (e.g., EB, MB, LB, IR1, IR2, etc.). A histogram of all periods per polygon then would produce a preliminary review of the areas of the Tel. The ceramic survey was completed. The staff is now preparing an official publication of the findings. In future this will serve the next step of archaeological excavations, which hopefully will be in the near future. 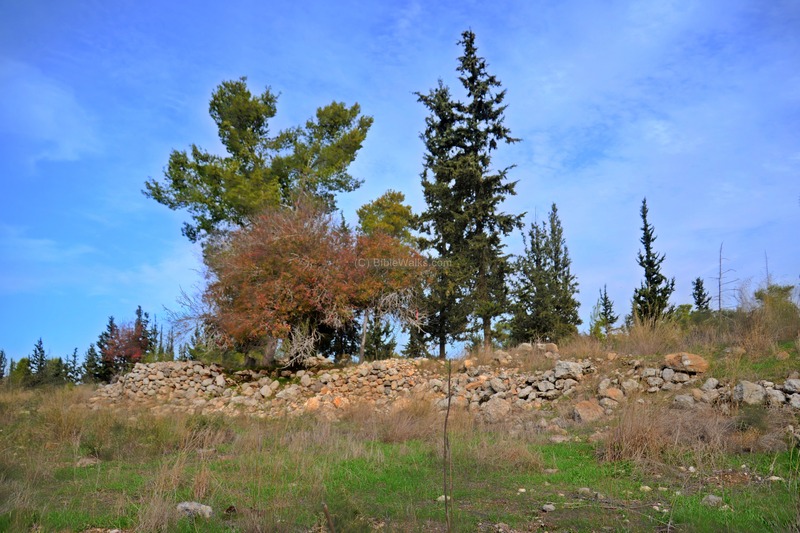 In Khirbet Άid el Ma are ruins of a village near the valley, north of the hill of Adullam. The road loops around the east side of the ruins, as seen here from the foothills of Tel Adullam. Its Arabic name, meaning according to the PEF name lists as "the ruin of the feast of water". This name was probably based on the wells located at the site. Another name of the place is Kh. 'Aid el Miyeh - "the ruin of the feast of one hundred". The Arabic name resembles the ancient name of Adullam, which helped to identify the site. 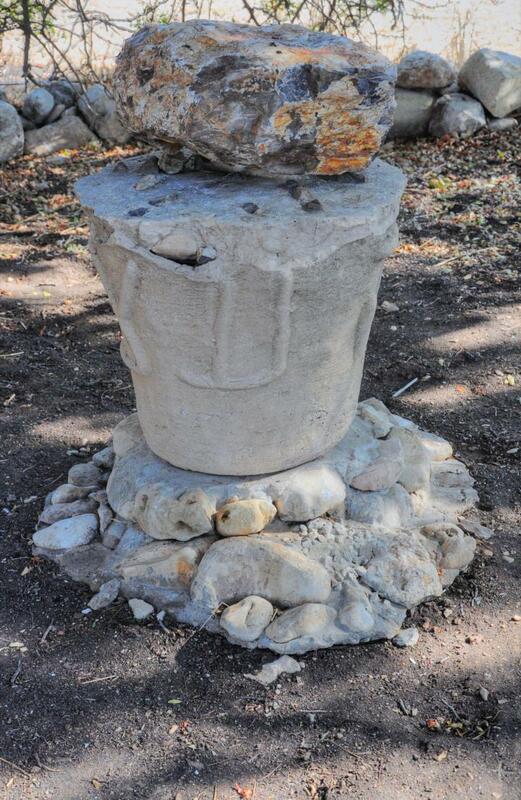 The 19th century PEF report was: "... some foundations and heaps of stones in the valley near the two great wells. The name preserves that of Adullam...". On the hillside north of the ruins are ancient caves. One of these is shown in the following photo. The 19th PEF report wrote about the hillside antiquities: "North ... are ruined caves on the hillside, and two or three cisterns". This cave is interesting, as well as the large carved stone in front of it (which may be an ancient altar, or may have served another function). On the way back from the hike to Adullam, we met Murdoch - an artist from nearby Rogalit. 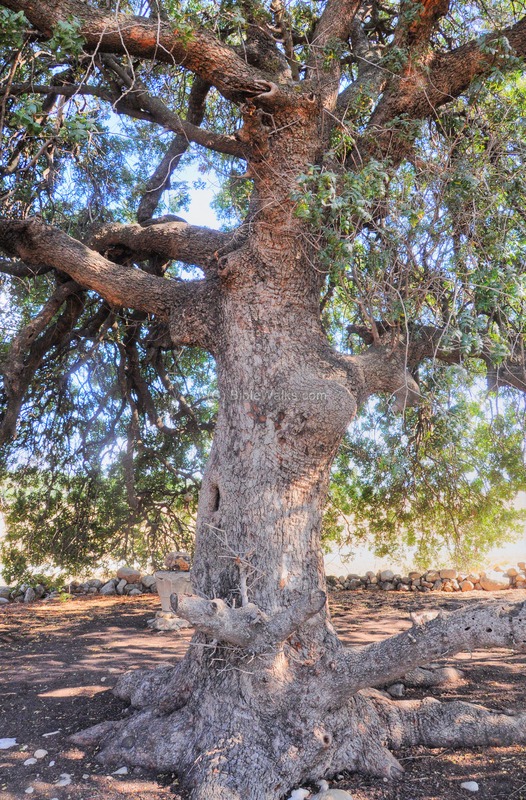 He advised to check out the large Terebinth (Elah) tree near the junction of the streams of Nahal Gedur and Nahal Elah. 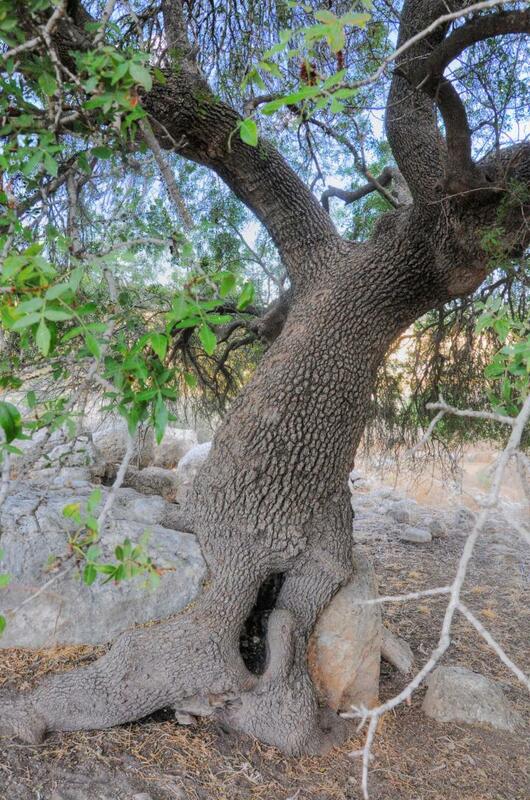 This impressive tree, about 600 years old, is the oldest of its kind in Israel. It probably appears in the drawing of the PEF report 150 years ago (photo below), although this may have been another tree closer to the site. In the far background is Tel Adullam, without the forest trees that were planted later (probably by the JNF/KKL organization during the early years of Israel). On the left side of the summit is the structure of the Sheikh's tomb. Murduch pointed out to an interesting section of the bark. Take a look below - can you find an animal there? 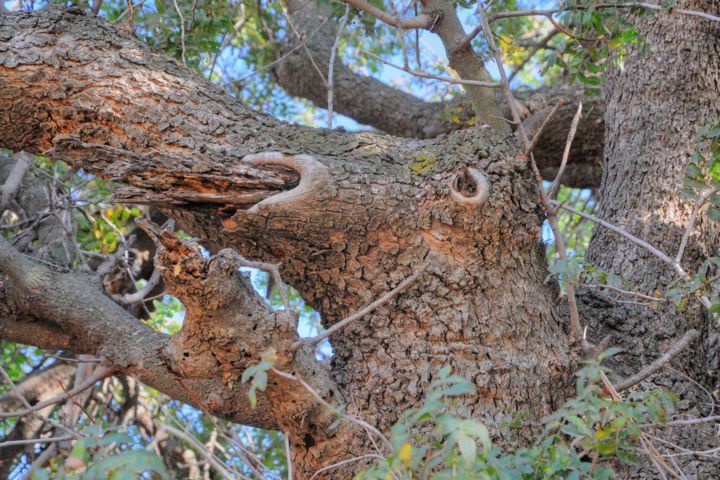 Murduch, the local artist, placed one of his sculptures in the shade of the tree. In its base, the Hebrew word of "Elah tree" is written along the sides , with the letters עצ ("etz" = tree) on the visible side. Murdach also told us that there are "positive energies" at this place and he often comes here to enjoy this special place. 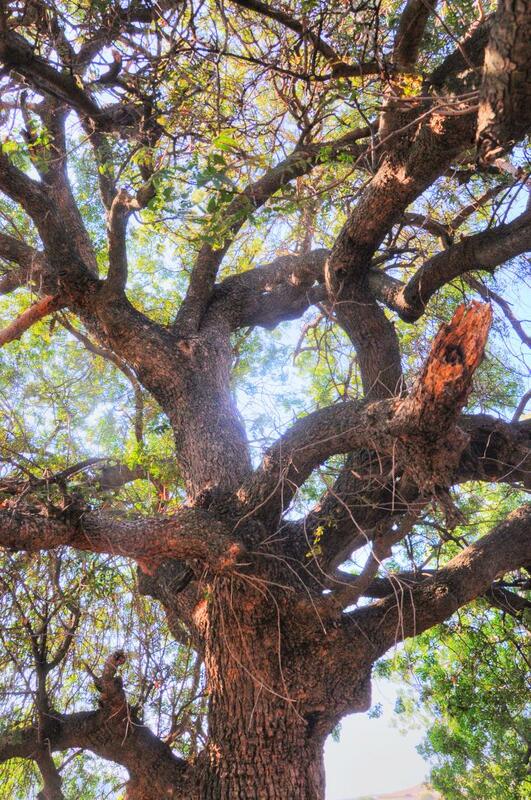 Indeed, we enjoyed resting under this impressive, ancient tree. Adullam - unknown meaning and source; mentioned several times in the Bible. Kh. 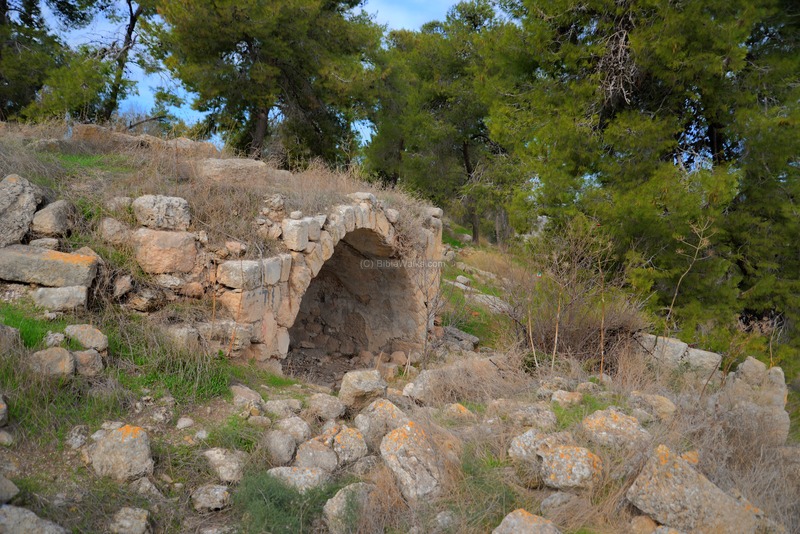 'Aid el Ma - Arabic name of the ruin north of the hill, meaning "the ruin of the feast of water". Another name is Kh. 'Aid el Miyeh - "the ruin of the feast of one hundred".